HOUSTON (Reuters) – A fire was extinguished at Motiva Enterprises [MOTIV.UL] 235,000 barrel per day (bpd) Convent, Louisiana, refinery on Saturday with no injuries, a company spokeswoman said in a statement. A source familiar with plant operations said the fire broke out shortly before noon on the 45,000 bpd heavy oil hydrocracker, called the H-Oil Unit, which was being restarted to full production for the first time since a fire last August. Motiva’s spokeswoman, Angela Goodwin, did not identify the unit involved in the fire. 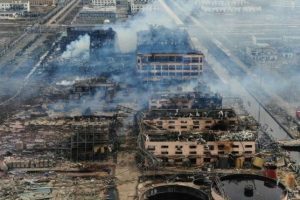 The August fire heavily damaged the unit and forced it to remain shut down until late November when it returned to production at half capacity. The unit was shut on March 3 to tie together the H-Oil Unit’s second repaired production train with the one repaired in 2016. Each production train accounts for half the unit’s capacity. Prior to Saturday’s fire, the unit had been expected to reach full production sometime next week. The H-Oil Unit is unique because it converts residual crude under high heat and pressure in the presence of hydrogen into motor fuel. Most refineries send residual crude like that which the H-Oil Unit processes to a coking unit to produce motor fuel feedstock and make petroleum coke, a coal substitute.